One of the main reasons Apologetics Press exists is to aid young people. Perhaps more than ever before in American culture, children are coping with numerous cultural forces that threaten their faith. Parents can easily find themselves unprepared and ill-equipped to deal with the sophistication of some of these challenges. God has blessed the staff at A.P. with the time and resources to meet these challenges. Our desire is to provide parents and their children with the necessary tools to deflect Satan’s darts (Ephesians 6:16). We believe that the time to provide our children with these answers is at the very beginning of their lives on Earth. We believe that as 3-5 year olds are becoming acquainted with books and are learning to read, they need simultaneous reinforcement of biblical principles pertaining to God and His creation (hence, our “Learn to Read” books). As children grow and expand their minds and their ability to assimilate critical concepts, they need additional spiritual reinforcement and teaching (hence, our Early Reader books). 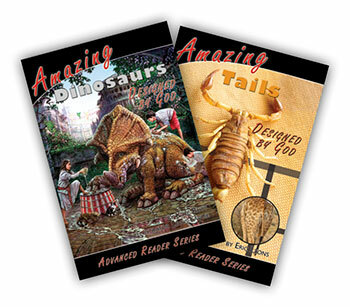 We are now most happy to announce the release of the first three volumes in the next level of our reading books, the “Advanced Reader” series: Amazing Dinosaurs Designed by God, Amazing Tails Designed by God, and Amazing Tamable Animals Designed by God. As usual, these A.P. readers are well-written, beautifully illustrated, and God-centered. Like the “Learn to Read” and “Early Reader” books, these new volumes will nurture a child’s spirit with the reality of God and His role in the Universe. Please pause and give some thought to those in your acquaintance who have children or grandchildren who would profit from these books, and apprise them of their availability.